1. 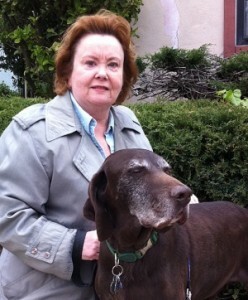 Read “Is a GSP Right for You?”. If you have not owned a GSP before, please read this article to gain a better understanding of the GSP breed and the type of environment in which it thrives. Be sure to view the video too! 2. Complete our adoption questionnaire. Please provide as much information as you can about your family, other pets, activity level, and why you want to adopt a rescue GSP. Because almost all of our dogs come to us with unknown pasts, we don’t adopt to families with children under 6 unless specifically noted. A note about hunting: Because we know nothing about the background of the majority of the dogs we rescue, we cannot guarantee the hunting ability of any dog. We do not have the volunteer resources to hunt test dogs. Any dog you adopt from us should be a family companion first, and if the dog is inclined to hunt that will be a wonderful bonus. 3. Talk with the rescue. You will be contacted shortly after your application is received, usually within 5 business days, with any additional preliminary questions we may have for you. Then, we’ll set up a phone call to further discuss your application and what you are looking for in a GSP companion. We will also determine whether we currently have any GSPs that we feel might fit in your family situation. 4. Talk with a foster home. If a GSP is identified as a potential match, we will put you in contact with the foster home so you can have a more detailed discussion about that particular dog. Based on that conversation, if the foster home and you agree that the dog continues to appear to be a good match, you will schedule a visit to meet the dog. The rescue dog will need to meet all members of the family, including other pets, at some point during the process. 5. Home visit. If after meeting the dog, everyone agrees he/she is a good fit for your family, we will schedule a home visit. The home visit will either be done by one of our volunteers or another affiliated rescue group. How long does this whole process take? On average, 2 – 6 weeks. 6. Adoption agreement. Once the home visit is completed and you are approved, we will ask you to complete an adoption agreement. If you do not agree to the stipulations in the agreement exactly as written, we cannot adopt a dog to you. Please note that we reserve the right to deny anyone the ability to adopt any dog from our rescue program for any reason. All adoptions are at our sole discretion. 7. Adoption donation: These monies help to defray some of the medical and other costs we incur while the dog is in our care. Pay by check or credit card (via PayPal). All of our dogs are spayed/neutered, wormed, current on vaccinations, heartworm tested and microchipped. Occasionally, a dog requires special vet care while in our program. We will provide you with the dog’s veterinary records so you will be fully informed of any known medical conditions. Dogs under one year of age: $410.00 with a $50.00 refund upon completion of a required basic positive-reinforcement training class from a trainer on our training list, or approved by us in advance. Training is required for dogs under one year old. Dogs one to five years old: $360.00 with a $50.00 refund upon completion of a positive-reinforcement training class from a trainer on our training list, or approved by us in advance. Training is required for dogs ages one to three years old. Dogs over 5 years old: $255.00. Seniors: $155 (those dogs that are designated as seniors on their posting). If you are a prior adopter, you can add a Great Senior Pooch to your family for free – just look for the Great Senior Pooch logo on their posting and mention it to our adoption team. 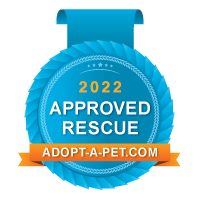 Through a special program in conjunction with PetFoodExpress, you will receive a coupon for 20% off your first purchase when you adopt a rescue dog! All you need to do is present the coupon along with your adoption paperwork within 30 days of adoption. 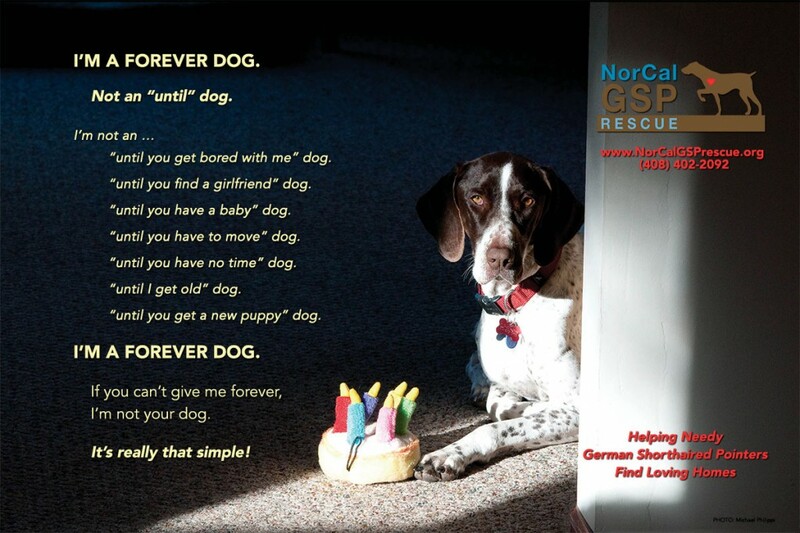 And, NorCal GSP Rescue will receive $20 when you redeem the coupon! Also check out Pet Food Express’s My Mutt program, another way that Pet Food Express celebrates rescued animals and helps out rescue organizations. Lastly, and most importantly, comes a lifetime of love and laughter with your new companion! We love to get periodic updates and photos of our rescues. They all have a special place in our hearts. If you would like to share a story and photos, please email us or “Like” us on Facebook and post photos and stories there. I fell instantly in love, especially when he placed his front paws on my shoulders and laid his face against mine. I wanted an older dog. They have so much love to give. I named him Ruairhdri (pronounced like the name “Rory”), which is Scottish Gaelic for red king, for his lovely reddish brown color. He is definitely the king of the house. Rory knew he had arrived at his forever home and got comfortable right away. He discovered the joy of constantly looking out the windows at home, especially the picture window in the living room. He looks like quite the distinguished older gentleman! But don’t let that fool you: He’s full of energy and loves to run around in our big yard. Rory goes to doggie day care every day while I’m at work and he LOVES it! On our walks, Rory is wonderful with other dogs. He greets them quietly and is very even tempered. During our Sunday morning walk at the park, I sit on the bench and he leans on me, rests his chin on my knees and looks up with those gorgeous big brown eyes. Rory is an absolute joy to have around. NorCal GSP Rescue will never get him back. He’s my baby! Read more about adopting an adult dog.